Stumbled across this Googling Chairman Avery after seeing his name mentioned in a book I'm reading. Two soldiers physically removing a private businessman from his property. I can't help but think how that picture looks like some 3rd world BS. 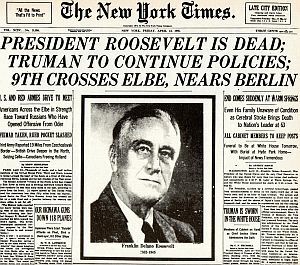 Yet another of FDR's crazy ideas that I don't recall being taught in schools, along with buying up crops in order to destroy them (https://en.wikipedia.org/wiki/Agricu...Adjustment_Act), throwing Japanese Americans in 'internment camps' (https://en.wikipedia.org/wiki/Intern...nese_Americans), etc. Many corporate executives have defied the government. How many have been willing to be carried from their offices by soldiers for doing it? Sewell Avery was. In 1944, Avery, the head of retail giant Montgomery Ward, was ordered by President Franklin D. Roosevelt to settle a strike with his workers. When he refused, the government took over his company. 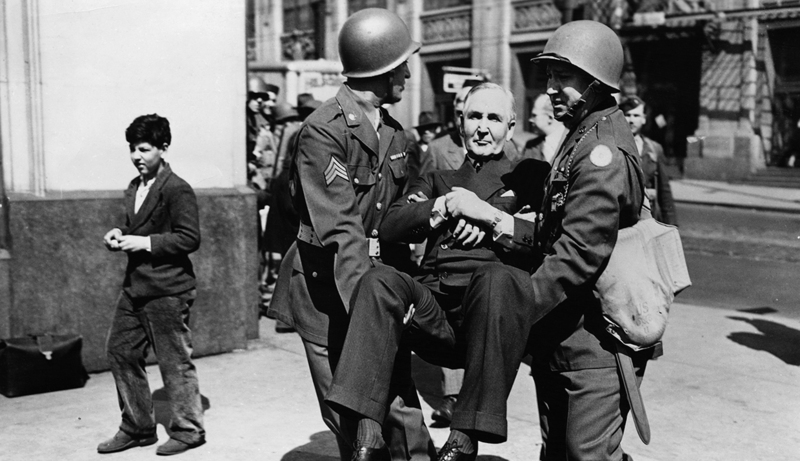 In an iconic photo of the era, two soldiers hold Avery in a sitting position, his arms crossed, a look of insubordination on his face, as they remove him from the building. Although the company was eventually returned to private hands, Avery didn’t relent in his opposition to Roosevelt or the New Deal. He continued to combine business with politics. The mixture didn’t go well for him, or for his company. Some Presidents think they're Kings. They look at what previous Presidents have got away with and figure it's OK to try this or that unconstitutional shenanigan. And they get away with it, too. Surprised you didn't mention FDR's gold seizure Executive Order. ...as well as other search engine "hits." As far as I know, there are still laws against hoarding food and other supplies somewhere in the law, but I don't feel like researching that now. Preppers beware ! Yeah, they think they are kings. I still think Obama is going to be the next one. With all the chaos in the parties, Obama 'staying on' until things 'settle' just might be in the offing. I've heard that April 12,1945 was a day of rejoicing on Wall Street and many other streets. I was only 3, however my entire family thought FDR was the devil incarnate. They always referred to his reign as the 12 years of Hades. If they felt that way about FDR, don't you wonder what they would say about the last 12 and especially, the last 7 years? They have all left us. The last one, my favorite aunt from Middletown,NY, died at 99 in 2002. I know they would have thought about Obama in the same vein, if not worse. These people were die hard Calvin Coolidge conservatives from the get go!